Hamilton Sinkler offers a selection of floor and wall registers for your needs. There is an array of beautiful designs and finishes you can choose from to update your old vents. These decorative aluminum floor registers offer the look of cast iron without the worry of rust and corrosion. This floor register features a classic design and offers a fully operational damper for controlled comfort. Try these decorative wall vents for an easy upgrade in your space. Made of cast aluminum with a black powder coat finish, these registers are both durable and decorative. Chrome floor registers will bring a sense of style to your room. Easily upgrade any space with these 9 different sizes. These gorgeous antique brass Strathmore vents are sure to bring a touch of old world class to your space. Use these air vents in your floor by simply dropping into place. Choose from 9 common sizes. 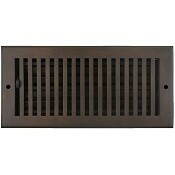 Take a look at these classic black Strathmore wall vents made with a solid brass core. Offered in 9 standard sizes, they are sure to bring a touch of sophistication to your space. Purchase our decorative floor register in this plated polished brass finish and redesign your home decor. There are 9 air vent cover sizes to choose from, all of which have an adjustable damper attached. These gorgeous antique brass Strathmore wall vents are sure to bring a touch of old world class to your space. Made from solid brass with a plated finish, these wall registers are made to be durable. Sizes 2 x 10 to 6 x 14. Update your home with these lovely chrome wall registers which are made from solid brass. Strathmore decorative wall vents come in 9 sizes and are also available as floor registers. The black floor registers will bring sophistication to your room. Made from solid brass with a sleek black finish. Easily upgrade your space with these 9 different sizes. Check out our gorgeous polished brass Strathmore wall vents. Available in sizes from 2 x 10 to 6 x 14, these registers are sure to bring a touch of warmth to your space. Bronze registers are a great alternative to more common metals. They have a unique look that will bring style to your space. Available in many sizes to fit your needs. These scroll registers are a great way to bring personality into your room with their warm, bronze patina finish. Our wall vents are equipped with installation screws and come in 26 sizes to fit your needs. Decorative bronze floor register are a great addition to any space. 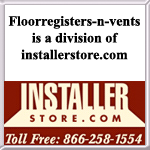 You will love these air vent diffusers which simply install by dropping into place. Bronze vent covers will bring old world charm into your home. The gorgeous Hamilton Sinkler wall registers are as eye pleasing as they are tough. Installation screws come with order. Purchase these stylish satin nickel registers which are made of solid brass. The finish is plated for durability and is more rust resistant than traditional metal registers. There are 19 sizes available. Decorative wall registers made from solid brass are an elegant choice for any decor. Plated in satin nickel, this heat vent is a more rust resistant option than traditional metal vents. Available in 21 sizes.